“Thick As Thieves: Personal Situations With The Jam” Now Out In Enhanced Digital Edition! – Paul Weller News! 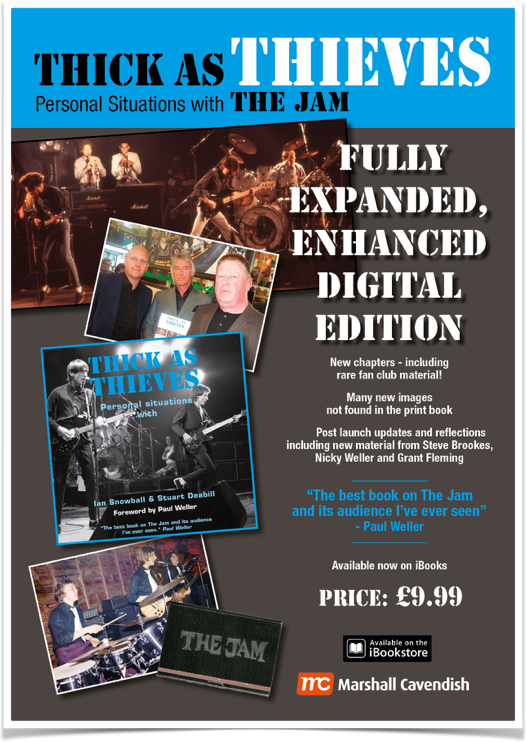 “Thick As Thieves: Personal Situations With The Jam” Now Out In Enhanced Digital Edition! 1 Comment on “Thick As Thieves: Personal Situations With The Jam” Now Out In Enhanced Digital Edition! The Jam were one of the most successful bands in the UK with album sales of over 11 million units. The music of The Jam has influenced a whole generation of kids it formed a soundtrack of their lives. Thick as Thieves explores just how influential The Jam were through interviews with the band, journalists, creatives, unusual celebrities and most importantly, the fans. The book reflects the aspirations and celebrations of growing up in the 1970’s and includes rare photographs and sharp insights on The Jam. It is perfect reading for the many thousands of fans still hungry for more. Fully expanded, enhanced digital edition! New chapters- including never before published fan club material. Hundreds of new images not found in the print book. Interspersed with audio- visual content, including music, interviews with the authors, fans and more. The Jam were one of the most successful bands in the UK with album sales of over 11 million units. 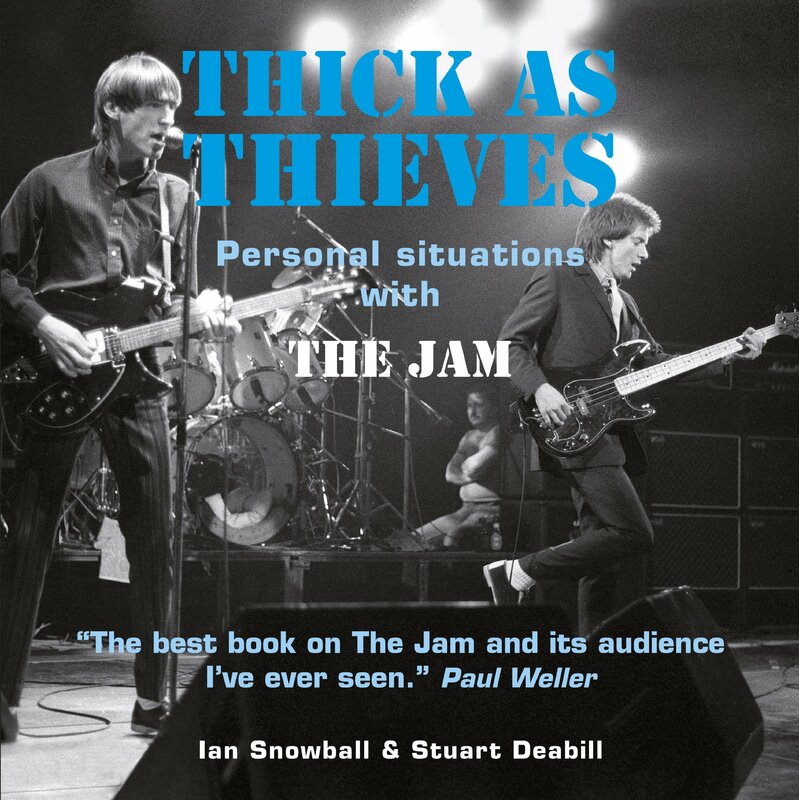 Described by Paul Weller as “The best book on The Jam and its audience I’ve ever seen”, Thick as Thieves is the definitive work on one of Britain’s most successful bands. Thick as Thieves explores just how relevant and influential the band is today. From the late 1970’s onward, the music became the soundtrack for a generation experiencing a seismic change. This new digital edition, that appears exclusively on the iBooks store, adds a whole new dimension to the best selling print edition. Stuart Deabill was born and raised in West London. His long standing obsession with Music, Football and Casual Attire has enabled Stuart to dress well, have good ears and a foul mouth for the best part of 35 years now. Stuart is married,now lives in South Hertfordshire and is a season ticket holder at Chelsea FC. Ian Snowball was born and bred in Kent. He became a Jam fan at the age of eleven after buying That’s Entertainment for 50p. He has a mixed taste in music that ranges from The Jam to The Doors, Northern Soul and Ska. He began supporting Chelsea when he was twelve because he heard that Paul Weller supported Chelsea. Has co-authored In the Blood with Northern Soul author Pete McKenna. UK iTunes store HERE for £9.99! US iTunes store HERE for $14.99! The paperback edition is still available HERE! Previous Entry Looking Back On Paul Weller’s 2014 Summer Festival Tour! Next Entry Dennis Munday’s Overview Of The Jam’s “Setting Sons” Deluxe Edition!